internet - Advertise this route to the Internet community. All routers belong to it. 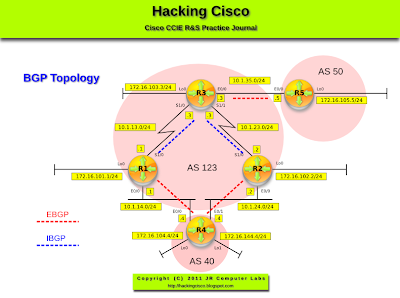 no-export - Do not advertise this route to eBGP peers (real BGP peers). no-advertise - Do not advertise this route to any peer (internal or external). local-as - Do not advertise this route to peers outside the local autonomous system. This route will not be advertised to other autonomous systems or sub-autonomous systems when confederations are configured. 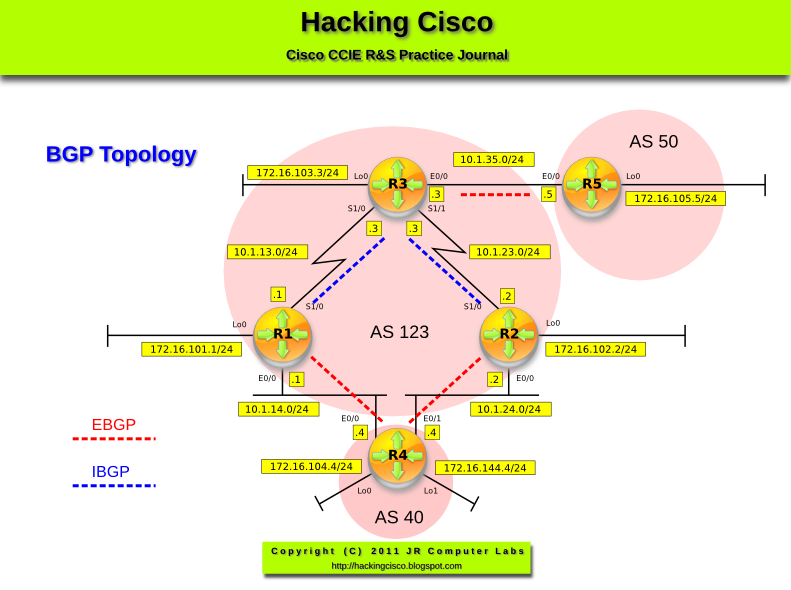 Configure AS 123 so that it accepts the BGP communities from AS 40. The routers in AS 123 must apply local preference=200 to all prefixes that use the community 123:200. 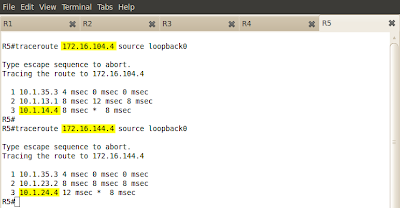 Given the policy in Task 1, configure R4 so that the traffic from AS 50 towards 172.16.104.0/24 is received from R1, and the traffic towards 172.16.144.0/24 is received from R2. Configure the routers in AS 123, so that all other communities starting with number 123: are removed from all incoming prefixes. Configure R4 to advertise additional community to the ones stipulated in Task 2 and verify that the routers in AS 123 remove them successfully. As always, when changing policy for outbound updates issue: 'clear ip bgp * out'. Pic. 2 - R1's Detailed Prefix. Pic. 3 - R2's Detailed Prefix. Pic. 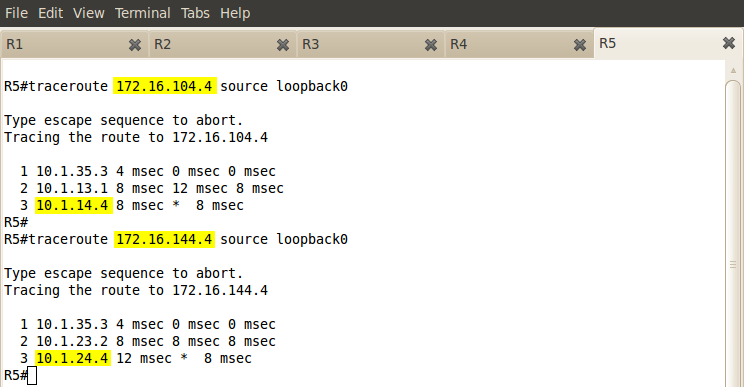 4 - Traceroute from R5. Pic. 5 - R1's Multiple Communities Added. Pic. 6 - R2's Multiple Communities Added. Pic. 7 - Result on R1. As per stipulations in TASK 2/3 the community 123:200 is not removed and applies the local preference of 200. The communities starting with 123: have been removed. Other communities (here: 600:100), have not been removed. Pic. 7 - Result on R2. Similarly to R1, R2 removes all communities with 123: numbers except for 123:200 which is used to apply the local preference 200 to the prefix.